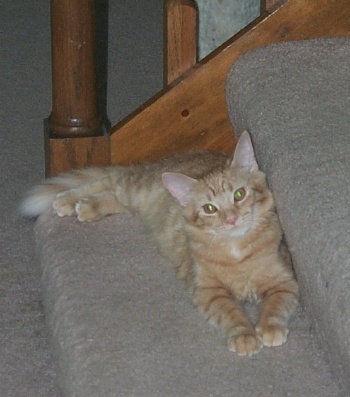 Pumpkin says the stairs are hers and you can't use them. For more Friday CatBlogging pictures, see the Friday Ark #62. Welcome Carnival of the Cats visitors. 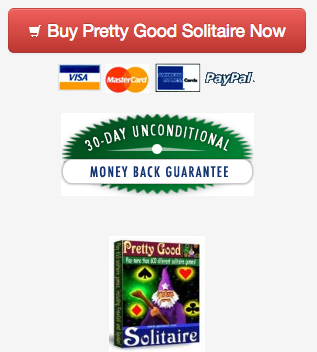 While you are here, download Pretty Good Solitaire and download the Cat Card Set. Note: this was originally posted on the old site on June 16, 2003. There's a lot a talk these days about building a community of users around a company. Both John Porcaro and Robert Scoble of Microsoft are talking about it a lot in their blogs. It's really what everybody wants to create, including me. I want to create a community of solitaire players (that sounds like an oxymoron, but there you go). It's one of the reasons this blog exists. 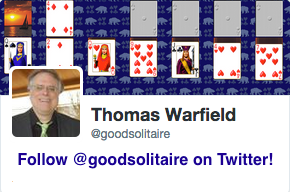 It's why I started the Goodsol Solitaire Discussion Forum about 6 months ago. The thing about communities is that they are delicate things and I don't think you can "build" them. They have to grow instead. All you can do is seed them and fertilize them, but they have to grow on their own. In order to have a real community, you have to let the people in it build it themselves. It takes time. For example, it has taken the Dexterity Software Forum (note: this is now the Indiegamer forum) the better part of a year to grow into what it is now, and it is just starting to take off. Alas for Steve, it's still only the independent software developers part of the forum that has begun forming a real community, the part of the forum devoted to his own products and customers has yet to take off. My forum hasn't taken off yet either. But it's still young and I think it can. What it takes is a critical mass of people interested in the subject to start posting regularly. At some point, the group hits a tipping point and becomes a real community. It requires time and enough interested people to get it going. I hope that it eventually happens with my forum. 2005 Update: The forum hasn't really taken off as a community, but it isn't a failure either. There are people posting messages every day. Today's new blogroll link is to Seth Godin's Blog. Note: This was originally posted on the old site on June 14, 2003. I've been reading the book How to Become a Marketing Superstar by Jeffrey J. Fox. It's a small book, but many of the best books are small. It's not a great book, but it has some interesting points. ...the good customer should be profitable to the selling company, pay its bills, and pay for what it buys. Good customers spread positive word of mouth and give positive referralls. Good customers can be tough, exacting, impatient, challenging, fickle, finicky, exasperating, demanding, needy, insistent, and a million other things. None of their traits matter if they are a good, "okay" customer. The wrong customer is unprofitable to the selling company. The wrong customer is not worth the price they are paying, the cost to service, the stress caused, or the opportunities they cause the marketer to forgo. Fox says that "The customer is always right" is wrong. He says the right (or good) customer is always right, the wrong customer is always wrong. Dump the wrong customers (or better yet, refer them to your competitors) and keep hold of the right customers. A lot of what he writes about is geared towards the business selling to other businesses. But it can be applied to businesses that sell to the consumer as well. The great thing about the shareware business, which can't be repeated too often and is underappreciated, I think, by people in the business is that there are very few wrong customers. Why is that? Because people who would be wrong customers generally don't become customers in the first place. Because piracy is so easy, the wrong customers pirate and don't become customers. For the most part we don't hear from them, and so we aren't distracted by them. We are left with the good customers. Today's new blogroll link is to Adam Stiles. Adam is the author of NetCaptor. Note: This was originally posted on the old site on June 12, 2003. What if customers ask features that you feel will make the game complicated / you dont like? Or features that you dont have the time/manpower to implement? Do customers get annoyed if their wish list is not implemented? The goal has always been to make a fun game that is easy to use. Much of the competition is stuck in a programmer mindset, that shows in the design, in the help, and on their web sites. PGS has always been designed to get you playing the game right away. And while there are a lot of features, there aren't too many. You can make a program with too many features (see Microsoft Word). Before I add a feature, I ask whether this is something that will make the game more fun or not. If it's just a "cool programmer thing", I don't add it in. If it's a feature that I don't think will add to the game and make it more fun, I'm not going to add it. But I've put in a lot of features requested by customers, because many of them did make the game more fun. Some of the best things in the game came from user suggestions. My reposting yesterday of Safe is Risky has generated some comment on other blogs. Although the post was written 2.5 years ago, I think it holds up pretty well. I think your best bet is to take a successful game, come up with a new theme for it, and add some significant new twists and other incremental improvements. You may not hit a grand slam this way, but if your execution is good and you’ve chosen the right game to imitate, you’re quite likely to hit at least a double. I think it depends on what you want to do. If all you are trying to do is get a game on a portal and hope it might get on the Top 10 list for a week or two, then Phil's advice is good. But that is not going to make you much money, and as portal proliferation continues, it's getting less and less all the time. The shelf life of portal games is getting shorter and shorter so fast that it's not going to be long before they are like movies doing most of their business on the first weekend of release. Is a Zuma clone, no matter how good, going to still be selling 10 years from now? I highly doubt it. Zuma might still sell in 10 years, but a clone has no hope. Pretty Good Solitaire, on the other hand, has a good chance of still selling 10 years from now (which would be a full 20 years after initial release). I didn't say anything about genres in my original post. The genre doesn't necessary have to be in new genre for a game to be new and different. To be new and different, a game can take an existing genre and do something significant to it to make something new. Obviously, Pretty Good Solitaire was in an established genre, even back in 1995. But it did a lot of things differently from the existing games that helped it stand out. These days, it seems like all people do to make a new game is copy some existing game and put a different theme of graphics on it. Hey, Aloha Solitaire was popular. Let's make Eskimo Solitaire! These might get on a portal and sell for a few weeks, but they aren't going to support a long term business. If you want to make a living off a game for years to come, you need to make something that is going to be popular for years and not just be whatever happens to be the hot trend at the time. Today's new blogroll link is to Creating Passionate Users. This is one of the best blogs around. Unfortunately, for the last week the blogger behind the site, Kathy, has been sick and she hasn't been posting. I guess that gives an opportunity for new visitors to get caught up with her archives. Her most recent post asks for what could cheer her up while she is sick - of course, the answer to that is to play solitaire!